Much has been made by the Rossi campaign over the alleged “felon vote”, with the slanderous implication that it would heavily favor Christine Gregoire. Well, I can think of at least one convicted felon who most likely voted for Dino Rossi: his longtime mentor, Melvin Heide. As was widely reported in The Seattle Times, The Stranger and other publications, Rossi’s rags to riches story is a little ragged around the edges. Rossi got his start at a real estate company owned and operated by Heide, that engaged in fraudulent business practices, bilking millions out of clients. As scandals and bankruptcies unfolded, Rossi’s colleagues fled to more reputable firms, but he stuck with Heide, following him to two other companies. On August 18, 1989, a federal grand jury indicted Heide on 18 counts of bank fraud, mail fraud, and making false statements. In exchange for other charges being dropped, Heide eventually pleaded guilty to bilking a Tacoma couple out of $400,000 — and on July 20, 1990, he was sentenced to three years in prison and ordered to pay $1.7 million in restitution. Perhaps this explains why several Republican readers took such offense by the technically accurate description of Rossi in my previous post? In light of the shady companies he worked for, the only thing worse than describing Rossi as an “unemployed real estate agent” would be to describe him as an “employed” one. Gregoire spent most of her professional career putting felons behind bars, while Rossi spent much of his working for one. So who do you think is more deserving of the “felon vote”? “Glass houses,” and all that. While bringing this up you forgot to mention the corrupt relationship between Booth Garner and George Janovich and the racketeering throughout Pierce County. Good ole Booths money helped him escape the criminal part that he was intertwined with…. So do you have proof of this Felon vote for Rossi? I know your just trying to prove a point, he knows a bad man, who did some bad things – how could anyone vote for a guy who knows a guy who did bad things. Do you not know anyone who has done anything wrong? Does that mean you did soemthing wrong. Is it a true reflection of who you are? Are you acussing Rossi of wrong doing or is he guilty be association? Glad I could inspire your latest Topic, it won’t be the last time I am sure. Chris… you miss the point entirely. Are these insinuations meanspirited and unfair? Well that’s what’s been coming from Republicans for the better part of two months now: Gregoire and the Dems are trying to “steal” the election… unsupported allegations of fraud and corruption… Dems are more likely to cheat than Republicans… felons are more likely to vote for Democrats. Rossi has turned an election that is extraordinary only in it’s extreme closeness into a referendum on the honesty and integrity the Democratic party and its supporters. And yet you have the gall to be offended when I describe Rossi as “real estate agent”…? Do you not see how over the top the rhetoric coming from your side is? And do you really believe that I could not respond in kind, if I so chose? This has long since ceased being about winning this election. And Chuck… that’s exactly the kind of unsubtle response I’ve come to expect from you. Careful… glass houses. Wow – it kind of makes you wonder if there are some shady real estate deals that folks should know about. This would make a great ad campaign if there is a re-vote. Real Estate, Deal Estate – – – Rossi is a me-first-er of the first kind. That’s the kind that’s in the game entirely for himself and his friends. His friends, in this case, are ultra wealthy individuals, mostly from outside our state, who have vested interests in the future plunder of our resources. We are about to become a Republican Colony! Why else would the Big Guys like Rove be helping out with the strategy here? The style of the Rossi whining campaign is unmistakably Rove and Baker. Rossi is the perfect front man for the developers and the forest industry. Goldy has written about the BIAW many times, but some of you may not realize what is about to happen to our wilderness here in Washington State. Washington has one of the largest national forest areas of all the states. To get at all those trees, just waiting to be cut, requires expensive roads to be built. How are we going to build them? The Bush Administration has removed the Roadless Area Rules specifically with us in mind. Those rules were carefully crafted several years ago to protect our last great forests and were supported by millions of people who called and wrote letters during the first and second comment periods. But, typical of the Bushites, it’s been decided – for us, that letting the lumber industry have an open season to make huge profits on the backs of the tax payers (because WE pay for the roads you know) is best for everyone. So, if the RNC and Bush operatives are helping out Rossi, whom do you suppose is going to be holding open the door to our Great State’s Resources when it comes time to pay the piper? Rossi is our boy – – – a guy with few scruples (as he is now demonstrating) and willing to please anyone – – – as long as they can help him out with some local financing and support. Yes! Dino will be great for this state! Just like Bush was great for Texas. After the me-first-ers are finished, we’ll be able to rename the state from Evergreen to, “Washington, the Wasteland State”. Apparently it was okay to count the outlaws ballots when Rossi was leading by 42 votes and calling for Gregoire to concede. Look, was Rossi EVEN indicted for anything? NO, HE WAS NOT. He wasn’t even sued. So, here we go again. More heat than light from the counter-blog to “Josef’s Public Journal” and “Sound Politics”. Okay, I really should SHUT UP for I am learning how to roar like Marummy! Oh and Mr. Berendt, (Comment by Paul— 1/8/05 @ 6:44 pm), guess who’s for protecting our wilderness AND sits on the Nature Conservancy? *Governor-elect unless you note the whited-out ballots, the Dead County voters, the vote fraud (“only one per customer”) and yes the felon vote. Oh and that’s just for starters. “sweeeeet monkey kisses to all”…you have a monkey? It was unsubtle because I paid close attention when the Janovich trial went down. He sits on the local boards of The Nature Conservancy, a group that buys land to preserve; and the Mountains to Sound Greenway Trust, which secures land for a huge greenbelt along Interstate 90. He touts two “Good Green Deeds” awards by the Washington Conservation Voters. And he said he opposed the Bush administration’s proposed reversal of the so-called “roadless rule,” a Clinton administration policy that banned road building, logging and development on about 58 million acres of national forest land, including about 2 million acres in Washington. King County didn’t use white-out. They used redacting tape. You cn pull the tape off if you want to see what marks are covered. Goldy, The Seattle papers tried to help out Gregoire during the campaign by insinuating all the same things you are and chip away at Rossi’s good guy image. It obviously didn;t work. He earned the image working out a budget with Locke last session. Gregoire is the one that has an image problem, as evidenced by all the Kerry and Murray voters who voted Rossi. So keep venting about Rossi’s connection to this bankrupt real estate felon guy, nobody cares. 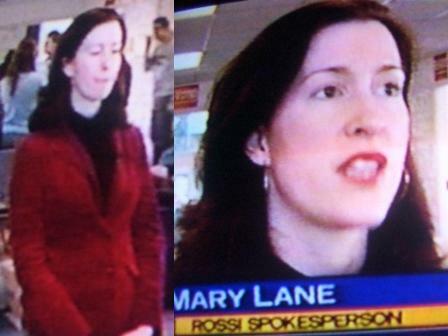 Have there been any polls of how many Kerry and Murray voters voted for Rossi? I wouldn’t think too many did that. I thought it looked more like around 200,000 voters only voted for president and didn’t cast a vote for governor – if they had voted for governor they probably would have been for Gregoire? Well, that’s not according to SWORN declarations by observers of the process. Go to http://pullonsupermanscape.typ.....ra_29.html to download & read for yourself. Besides, we will find out the real truth in a Chelan County Courtroom soon enough. Josef is up to his sad old arguments, trying to prove Dino Rossi is an environmentalist. You are a joke, Josef. No offense, but I’m tired of reading that recycled garbage. You’ve made those whiny, pathetic arguments before to other people. By that logic – I suppose if George W. Bush sat on the board of the Sierra Club, that would make him an environmentalist, even if he supported letting polluters get off scot free with their destructive practices and continued to pursue drilling in ANWR. Nope. Sorry, Josef. Labels only go so far. Goldy – EXCELLENT, EXCELLENT hit on Rossi. I really liked the way you wrote this. Just read the lawsuit. ( on Rossi site) Worse than we thought, just a mess of stuff from dead voters to felons to totals to changing the rules …..and on and on….what a poor excuse for a case. Folks have already noted the PR message is no longe fraud, but “it is just such a messy mess.”……..at least that vindicates all the Dems posting here for weeks….we have all agreeded there is no real fraud….just some mistakes and grieving elders, etc. Rossi now ageees…..X Files are documentry….. Sorry, sorry. sorry C and ProundAssed. Well, I agree w/ your point about GWB but you have little to rebut it other than an analogy about a President we both despise. The problem is that G.W.Bush would be asked to leave those boards and harassed relentlessly if he did not for pursuing the policies you named. You should note the gist of my point though: Dino Rossi DISAGREES w/ George W. Bush on the environment!! As of last week, just 40 percent of state residents believed — in the most recent Elway poll — “the election is over and like it or not, Christine Gregoire is the legitimate winner.” A combination of nearly 60 percent of poll respondents thought the election was not certain or legitimate. Only 65 percent of Democrats saw Gregoire as the legitimate winner, according to Elway. Oh, I’d realize I’m on thin ice over resistance to a revote you all. The Elway Poll is the gold standard in this state. I am not offended. as I have repeated numerous times, I just find it curious, your choice of descriptions. You have explained why you choose to do so, paypack to the R’s for their mean spirited insinuations. You are fee to do so, obviously. I truly don’t care what you call Dino Rossi. Soon we may be calling him Governor. It’s not terribly original, but I like “Dino Lossi”. Or we can just call him “toast”. I forgot to start posting by my new name, as I told Goldy I would. After all I was a busboy 18 years ago and I am no longer one. So, “Technically” this is an accurate name for me. Toast? Not very Creative but I’ll give you a break, it is late. How about DoneO Rossi? I won’t even charge you for that one! The Dems continue to spin the “we told you there is no fraud or conspiracy” yarn. No one ever said this was a “vast left-wing conspiracy”…but it is a comedy of errors, neglect, omissions & wrongful acts. And yes, some of those wrongful acts may rise to the level of fraud. But that is not necessary. The other Dem “spinner” is the R filing doesn’t have any PROOF. Well DUHHHHHHHHH! It is merely the allegation. That is the first step. It doesn’t require the R’s to show all their evidence at this time. They have plenty of evidence….and are gathering more daily. Lot’s of stonewalling going on in providing the requested documents and making things reconcile. 1) Every voter who actually voted should be identified and his vote was legitimately counted. 2) No illegitimate or “phantom” votes should have been cast. Can’t we at least all agree on that???? I don’t care about any poll whatsoever. Don’t mention them to me. People can be manipulated and led to believe false things. How do you think this country got tricked into supporting a war in Iraq? Polls are B.S. Especially with the BIAW and revotewa doing radio, TV, and newspaper advertisements. Well, I see you are the Democratic Mr. Cynical. I personally HATE the BIAW – they don’t play fair, lie and steal. Besides, every poll has called for a new election to Save Our State. Josef – don’t put too much faith in polls. Most polls still show a majority of people believe Saddam was directly tied to 9/11, despite the White House, CIA and 9/11 commission report publicly denying that very fact. I’m not trying to say the public is stupid, just that polls are not reliable arbiters of fact, and as Republicans constantly point out – “ruling by poll” isn’t how good leaders work. You can’t have it both ways. Either it’s a good policy or not. Let’s see…doing what the people want or doing what WSDP wants. Which policy sounds more viable? You’re making a case for the R’s. C’mon Reggie – We all know the Republicans _love_ to have it both ways. First they’re against the re-canvass, then they’re for it. Ruling by polls is bad when a Dem does it, ruling by polls is good when a Republican wants to do it. Polls are notoriously subject to big swings, and good strategic thinkers know not to change their strategy due to one or two polls. There’s a reason it’s called representative democracy. We elect the officials to represent us, and then have a periodic chance to vote them out if we don’t like what they did over that period (or think someone else can do a better job). We don’t vote every month or every time a politician makes a decision we don’t like. Should football coaches be fired or change their strategy every time the fans demand it? Same basic principle. Here’s more examples of Republicans wanting it both ways. Massive structural problems with elections in Ohio, NM, Iowa, Florida? “Get over it”. Innuendo and possible errors in WA? Re-vote! Jim McDermott releases a phone call? Hang ’em high! Tom Delay and his cronies commit multiple felonies? No biggie – let’s protect his seat and fire any Republican who even questions him. Democrat actually wins by a small margin in Montana, reinforced by several court decisions? Let’s figure out a way to avoid having him seated. Kentucky court says your candidate is obviously ineligible? No biggie, let’s seat her anyway. Republicans question a Democrat? Fact-finding. Democrats question a Republican? Treason. I’ll say it again – Republicans love to dish it out, but they’re so thin-skinned they can’t even handle a thimble-full of their own “medicine” dished back at them. It is called nobelesse obliege. What they think is citizenship is the gift they give to the riff raff – who are by staus all Democrats. Aspirations to money and education and family lineage – little of which they have in this era. I like what you’re writing here – as a Dinocrat more because of what Governor-elect Rossi’s against than who & what he’s for. I think polls and facts are 2 seperate things. Polls take the temperature of public opinion. In fact, Christopher Columbus’ sponsors would be in today’s world hit w/ polls that 99.9% of people think he would fall off into nether. More info please about Kentucky!! I’m afraid it’s getting that way. Look at the AG fight – I wish President Bush would just do a national search and find a right-of-center guy who is NOT a whack. Basically, the Republican candidate for a state senate seat won the election (by about 1000 votes), but wasn’t eligible to become a senator – she didn’t meet the residency requirement (be a resident for the previous 6 years). She lived in another state from 1997-2000, got a drivers license there and received in-state tuition there. She claims she was “planning to move back to Kentucky”. A circuit court judge ruled that the Republican candidate wasn’t eligible to become a senator and should be disqualified from the election race. The Republican-dominated state Senate then voted to certify her win anyway, prompting at least one long-time Republicans to threaten to resign in protest. The Republican candidate claims she was “unaware” of the 6-year residency requirement (since she was born in Kentucy). Let’s not forget that the Republican candidate’s father in a state Senator. Complicating matters are that the Democratic challenger filed the suit late in the election (she didn’t miss any formal deadlines, but the Republicans are critizing her for filing the lawsuit the day before the vote). Republicans also claim that state law gives the Senate the right to decide who becomes a Senator (i.e. they believe they can override a judges ruling and the state constitution). Or we could discuss all the strange behavior of Republican Sen. Jim Bunning from Kentucky, who is probably (sadly) suffering from and hiding his dementia. He cancelled one debate at the last minute, broke the rules by using a teleprompter (while hiding in the basement of the RNC) during another debate, compared his opponent to one of Saddam Hussein’s sons and falsely claimed that his opponent’s staff had “roughed up” his wife at a picnic. Yet voters in Kentucky narrowly sent him back to office (helped by vicious false rumors spread by GOP surrogates that the Democratic opponent was gay). Reminds me of Strom Thurmond, who quite clearly wasn’t capable during his last one or two terms. As others have said, be careful the company you keep – If Rossi were elected I’m sure he’d abandon you (and any other Democrat who voted for him) faster than you can say Karl Rove. Look at how fast the GOP turned on Arlen Specter, Joe Hoefly, Christine Whitman, Colin Powell and Sam Reed the minute they strayed from the increasingly right-wing party line. Interesting parallel. Rather than calling for a “re-vote” to solve the “mess”, the Democrats are saying the law doesn’t allow for that, so the court’s ruling should be followed. Thank you. Ken. State Senator Dana Seum Stephenson is yet another fraud. Just like Joe Zarelli (Google that whenever you’d like). I cannot believe that man was re-elected… the Democrat must have ran a half-hearted campaign or there was fraud. I also cannot believe the State Dems did NOT impeach him in 2003 or 2004!!! Chickens!! Oh, I fully intend to remind the Rossi Admin. WHO blogged for them, WHO got Dems over to them, WHO worked w/ them, blah, blah, blah. *Gregovych IS evil. Otherwise, I’d root for the Democrat. My brisk version of reasons includes being anti-transparent gov’t, pro-tax & spend, autocracy, being a racist and more. What we’ve seen out of this power-hungry creep the past few months should say enough. And if the Democrat AG candidate was like AG-elect Rob McKenna, fighting ALREADY for transparent gov’t – I’d vote for her too. Also, I voted for a GOP State Representative for helping me out a while back (long story). Otherwise, I voted for the Democrat w/o flinching. 2) No illegitimate or “phantom” votes should have been cast.<<< No, we can't agree on this! 1) Our system is designed to verify a voter's eligibility at the front end -- when they register -- not at the back end (after an election). The system doesn't have either the technical means or resources to back track and verify the eligibility of everyone who voted just because you're sore about losing an election! Moreover, the law doesn't require it. If you don't like the way things are done now, then lobby to change the law (for future elections), and while you're doing it please offer to pay some additional taxes for the gold-plating you want. 2) Please define "illegitimate" and by the way I'd appreciate a little concern on your part about disenfranchised voters, e.g. 573 people in King County whose votes were wrongly not counted. The Repubs fought tooth and nail to keep those votes from being counted. Which is worse, a few ineligibles who sueeze through the cracks because the system isn't perfect, or going to court to disenfranchise eligible voters? I mean, how low can you stoop? As for "phantom" votes, there weren't any. Every vote that was counted represents a real ballot cast by a real voter. This argument is the Mother of All Red Herrings. They're two different lists -- the Repubs are comparing apples to oranges. To claim there's a discrepancy between the number of voters and the number of votes, they used an updated voter list that was never intended to show who voted, and doesn't show who voted. That's dishonest.